In Bandarban there are lots of tourist spots and these are well decorated for attracts tourist mind. Hanging bridge is one of them. 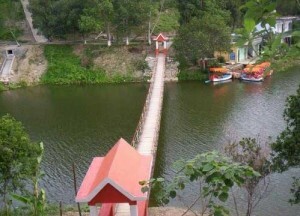 Hanging Bridge is known as Jhulonto Shetu in Bengali. Bangladesh Parjatan Corporation built some hanging bridge in Bandarban. Some tourist spots become popular for hanging bridge. 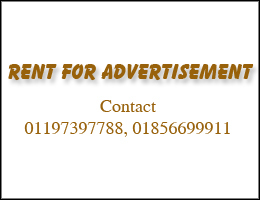 Hanging Bridge increases the beauty of the lake with surrounding natural environment. When a traveler crosses the hanging bridge he will obviously feel the natural serenity. There are two attractive hanging bridges at Meghla Eco Park Bandarban. 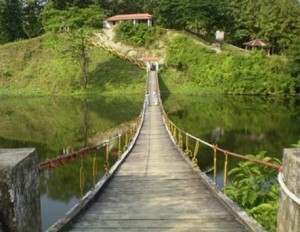 There is also a hanging bridge over the Upabon Lake which is longer than Meghla Parjatan hanging bridge. Besides there are more hanging bridges in some other locations of bandarban.